NASA is including some very special cargo with today's Juno mission to Jupiter - three Lego minifigs. At 11:34 am EDT on August 5, NASA will launch (or did launch, depending on when you read this) the Juno spacecraft to Jupiter. The probe will take five years to make the journey, arriving in July 2016, and is scheduled to make 33 orbits of the planet over a roughly one-year period. Once the mission is over, it will be intentionally "de-orbited" into the Jovian giant. 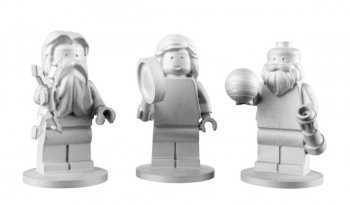 It's an ambitious and scientifically significant mission, but what makes it truly remarkable is not what it will send back from Jupiter, but what it will take there: three specially-designed Lego minifigs of the Roman god Jupiter, his sister Juno and the pioneering astronomer Galileo. It may have the ring of a slick marketing campaign but it's actually NASA who went to Lego to commission the pieces specifically for the mission. There are apparently some big Lego fans at the space agency and they wanted to do something special to commemorate Juno; Lego liked the idea so much that it agreed to foot the entire cost of the designing and making the minifigs. And these aren't your every-day, out-of-the-box minifigs, either. The units are the same size as standard plastic minifigs but are milled out of aluminum and designed specifically to ensure that they won't interfere with any equipment aboard the ship - and to survive the long journey, of course. Each minifig cost $5000 to make. The minifig crew is part of the Lego Bricks in Space program, an "outreach and educational" partnership with NASA designed to encourage interest among children in science, technology, engineering and mathematics. Lego has a website dedicated to the collaboration at Legospace.com, which is actually pretty cool, with pictures, wallpapers, videos, a game and even a few educational links. If you prefer a little less of a "colorful plastic brick" approach to your science, you can get a more straight-up skinny on the Juno mission at nasa.gov.